December 21, 2017—–This book is the product of two individuals with very different backgrounds but with a common objective. That objective, to provide some data and suggestions for slowing or halting climate change and its consequences. 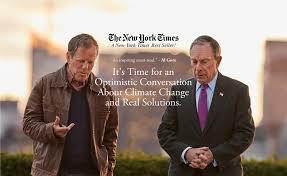 They each are vastly experienced in dealing with climate change. In this book they present a positive future for climate change and some solutions for solving the problem of the rapidly warming planet. Michael Bloomberg is a former mayor of New York city. Bloomberg discusses the role cities play in greenhouse gas emissions and why they must and can lead the way to lower emissions. At the present time the majority of the global population lives in urban areas. By 2050 it is estimated that 75% of all people on the planet will live in cities. Carl Pope is an internationally known leader in the effort to protect the environment. Early in his career he served in the Peace Corps in India. On returning to the United States Pope began working as a lobbyist for the Clean Air Act. The primary purpose of the act was to reduce greenhouse gas emissions. Oil was gradually replacing coal as the overall primary fuel. It was not until 2016 that oil passed coal as the major source of greenhouse gas emissions. Gasoline and diesel oil were the primary fuel for vehicles and still are today. However natural gas, hydrogen and electricity have been added to the mix. Pope states that we are now on the springboard of using electricity for vehicle power. In addition to his work on the Clean Air Act, Pope also served as executive director of the Sierra Club for ten years. 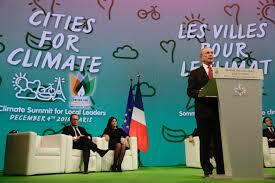 Cities move forward to stop climate change. The two men point out that the climate of the planet has been changing for four and a half billion years. However, it is hard to define climate change because numerical data on climate change is available for less than two centuries. A major question is how far back must we go to be certain that things are different now than in the past. Another question is the role of the human species in climate change. People have been changing the natural environment for thousands of years, or perhaps longer. It has only been since 1960 that burning fossil fuels began contributing more greenhouse gases to the atmosphere than agriculture and deforestation. The authors believe that climate change can be stopped. The way to do it is for people, businesses, and cities to take the power available to them to change the way things are done. These groups can show the world how to make the changes necessary, to not only stop climate change, but generally make the world a better place to live. This can be done by changing the way the economic markets work. Pope and Bloomberg suggest a variety of changes that can and should be made. 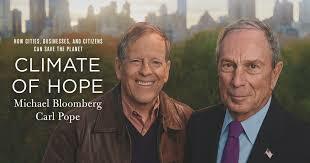 Mr. Bloomberg suggests the cities of the world will be the decision makers in reducing global warming and climate change. The simple reason? They must deal with many aspects of climate change on a day to day basis. Cities are beginning to band together to share knowledge of how to deal with climate change. A recently formed group called the Global Covenant of Mayors now has more than 7000 members from around the world. Another significant event that is occurring with respect to climate change is the widespread public support for taking action. Demonstrations around the world are evidence that people will act! Categories: Climate Change, Energy Programs | Permalink.